So the boys have been in school now for over a month. Life is busy. I've been doing my mental health support job - meeting with the same client I've been working with for the past 18+ months three times a week. In addition, I've been teaching psychology classes at a local college. I adore teaching. Both of the jobs are part-time. I do not have as much free time as I thought I would (indeed, I've barely been reading at all, and am just meeting the bare minimum with my running), but it's good to be productive. Picture taken at the NC Zoo last month. I am home for the boys when they get off the bus at the end of the day. I am not working all those nights like I was during the summer, for which I am extremely thankful. The hardest part comes when the boys are sick - then things can get a little hairy. And there will be times that I will still need to work nights, but at least I'm getting a break from that for the time being. Back in 2002 when my employer started a program where they would match the finances put into a masters degree, I was the first person at my job to jump on board. It was hard working a full time job and doing my masters at the same time. It took me 2 1/2 years, and my last semester I made a big push to finish it - working full time and being a full time student. Today, I'm thankful I made that choice. It opened the door for the types of jobs I am doing now. I never would've guessed at the time that the choice would be so important to me years later. A good reminder that when an opportunity arises, sometimes the best thing is to jump in. Readers, what choice did you make many years ago that you are thankful for today? You will be really looking forward to the holidays! I will be happy if I can get the logs sawed up for our winter heat, not much time what with all the rain. Wait until they get to high school and you have to drive pick them up from activities. I certainly don't envy raising little kids...whew, tough job. Switching from psychology to computer engineering has been a great decision for me. It sounds like things are going really well for you! That is awesome! You have a lot of irons in the fire. I miss teaching some, but love my free time better. I have been out all week and it was cold. I was 38, had 3 children in school, was partners with my husband in his construction business, and went back to school to become an RN. Yes, it was hard at that time, but so thankful I did it. I agree, if the opportunity opens for you to do something you love, do it. My daughter is following in her Mom's footsteps. She is 43, has two children in school, teachers High School English and just got her Masters and is getting a Specialist degree right now. She says it is all for the future. As a traditional women, I think it's better to me to work at home and do anything for my family. But for financial reason I had to make a choice to work outside for better result. But when my children get sick, like as you, I usually so confuse. it's hard to me to make a choice. Now, My children have already go to school outside and I have more time to focus on my job. I feel better now. Both of family and job should be my priority. I'm glad I went to grad school in 1985. I had not even considered it until a professor encouraged me. And I'm glad I started working for the newspaper 5 years ago. I didn't have experience in journalism, but I believed I could learn. Well, I'm hoping to have some luck selling my photography soon. Hopefully I'll think that was a good choice. good for you. you keep a lot of balls in the air at one time. oh yeah, i get t - that jumping in . . and wondering where time went - and the simple joy if life itself . . . I'm happy with the way things are. I know my husband would love to quit his job all together, and make sculpture and jewelery. Realistic it is not. He's been working more hours at work because someone quit. It's not what he wants, but I do like that extra income coming in. I don't know how you do it all! Good that you got your Master's and can now reap the benefits of it. I'm glad we made the choice for me to stay home to raise the kids. Of course, it makes it difficult financially with college, but my kids are so centered and our family years were really nice--no stress. Do you know what? We admire you! Wow! Good for you. I sometimes wish I would have pursued my first love - psychology. But science stole me away. I would love to hear you teach. I left the Marine Corps and moved to a very isolated spot in the Blue Ridge Mountains of Georgia. I'm glad I did that. So proud of you, Lisa. You obviously are doing a great job of balancing all of the balls in one's life (being wife, taking time for hubby, raising a family of 3 young ones, and WORKING when you can)... That is TERRIFIC... You obviously are very smart and certainly did the right thing by getting your master's degree when you could. Bless YOU!!!! You are such an inspiration to all young mothers. So smart you did the extra work before the boys came along! It is tough juggling work and children when one of them becomes sick. My DIL's company is pretty understanding when she has to stay home. one of the best decisions i ever made was to quit my job and stay home with my kids until the twins started school. i loved the time i got to spend with them and i was just thinking last night as i layed in bed wondering how i got to this point in my life where my kids are all almost grown, the twins are 12 now. i am happy but really miss those early years of having kids....i mean i REALLY miss it! you might remember that i work part time in the high school and i do like that, perfect hours for me! Going back to school as a mom with two kids. Hardest thing I ever did in my life..not the classes, but the time it took away from my family. Of course juggling college with family is hard. I wish I had gone on to get a masters in my field, but at that time in my life I was just glad to be done with the basic degree! Congrats to you for completing yours! I love your ambition and well balanced life ! That lion stretching photo is awesome by the way !! Wow, I didn't know you taught psychology classes! I teach online English classes; although, I just received a promotion at work, so I may stop teaching for a while. There are many choices I made in the last few years that I'm thankful for today. The first is that I decided to stay with my husband (even after his bout with addiction to pain medication). He's clean and sober today and very much back to the husband I married. I'm also thankful for taking time off from work to be with my little boy during the baby years. I will never ever regret my special memories with him. What a great question! i was going to comment on the cake piece ... but it wants me to log-in into FB ... weird??! i love the stretching lion ... i was thinking? 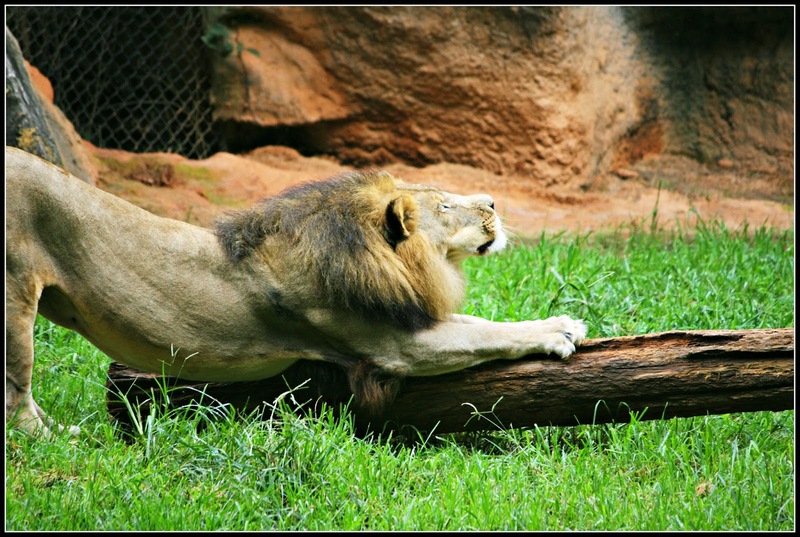 have i ever seen a lion stretching? maybe a comic or something like that? What a blessing that you made that decision! Like Beth, I was going to comment on the chocolate goodies but I don't like to use FB for it. It's great to read how your work/home balance has worked out for you. I'm still working on mine, but back in the classroom was the right move. It's my sweet spot.